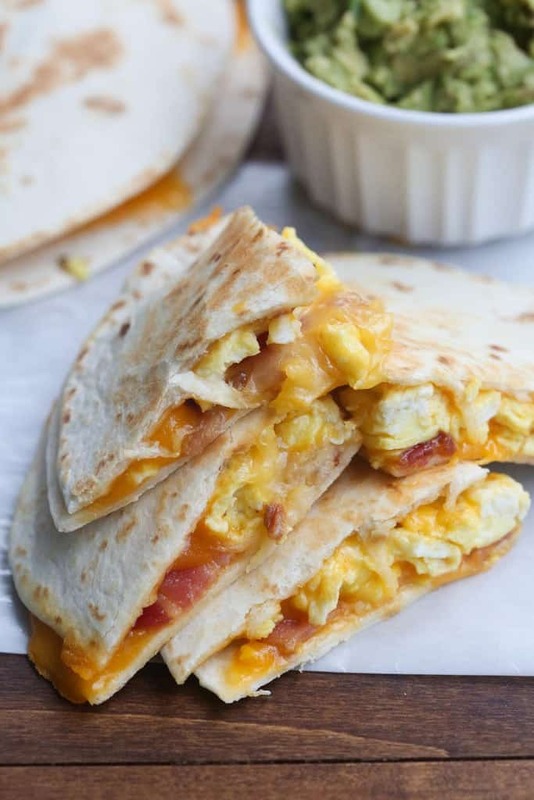 Breakfast Quesadillas with bacon, egg and cheese. An easy breakfast or dinner idea your family is sure to LOVE! For as much as I love making and creating new recipes, I must admit that, just like most moms out there, there are nights when it’s a real struggle to think of something to make for dinner. If you’re ever looking for breakfast for dinner recipes JonesBrinner.com has tons, including a few that I can’t wait to try, like these Bacon French Toast Sticks and BLT Breakfast Sandwiches. 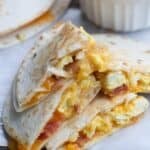 And if you’re loving the idea of a breakfast quesadilla you should also try these Jalapeño and Canadian Bacon Breakfast Quesadillas. 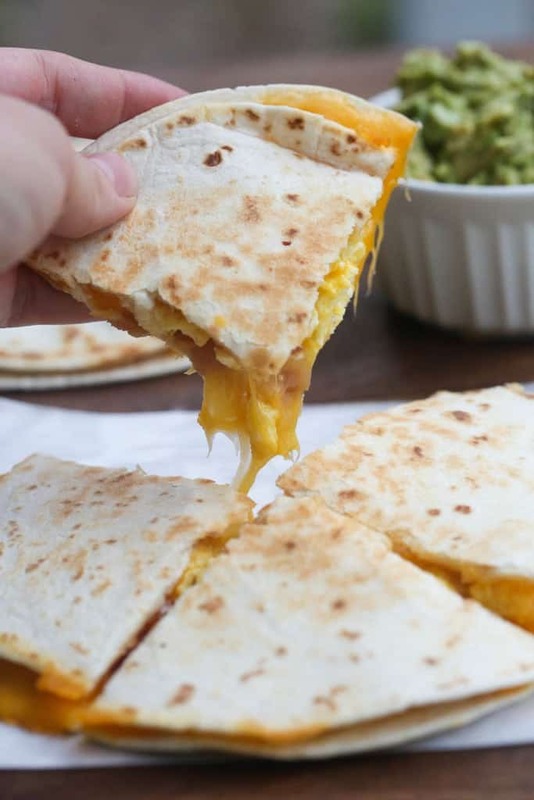 My kids love quesadillas in any form, but I usually like to add something more than just cheese to them to make them more filling and substantive. 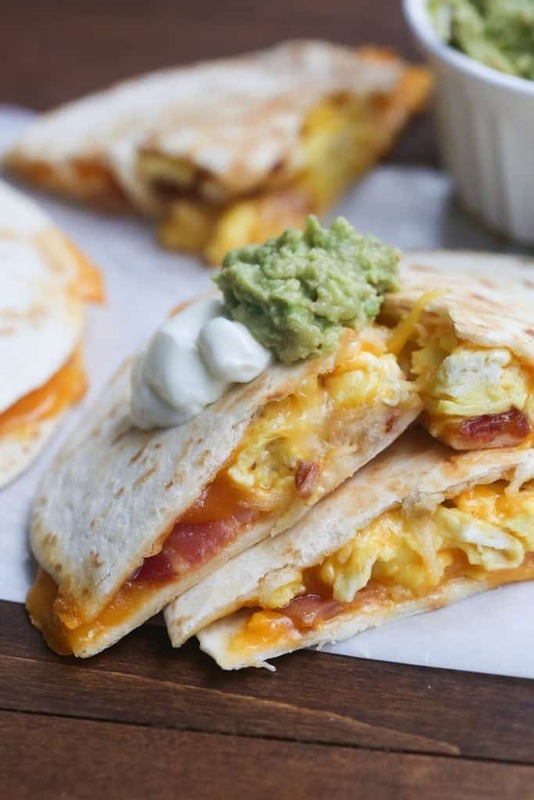 These Breakfast Quesadillas are filled with scrambled eggs, cheese, and the tastiest chopped bacon around. I always have to cook an extra few slices of the Jones Dairy Farm Cherrywood Smoked Bacon because my family just can’t wait until dinner is ready. We’re a total bacon-loving family, especially my boys. I also really like their Turkey Bacon, which you could easily substitute in this recipe. 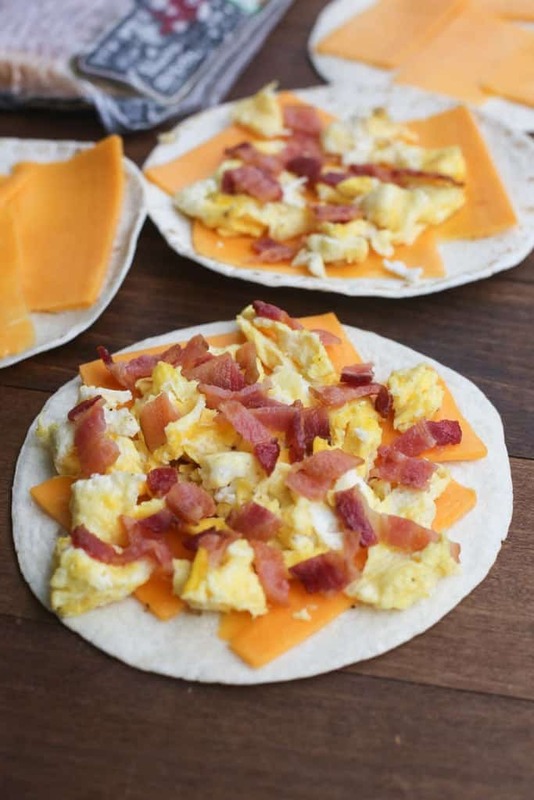 These Breakfast Quesadillas with bacon, egg and cheese are an easy breakfast or dinner idea your family is sure to LOVE! Add the bacon slices and cook, turning once, until crisp and brown (or to your preference). Remove to a paper towel-lined plate. Once cooled, chop into pieces. Wipe out a little of the bacon grease from the pan. Crack the eggs into a bowl and add a splash of water or milk. Whisk until smooth. Pour eggs into skillet, season with salt and pepper and scramble until cooked. Remove to a plate. Cover one flour tortilla with a thin layer of shredded cheese. Top with some of the scrambled eggs and some chopped bacon. Top with some more shredded cheese and place another flour tortilla on top. Carefully set the quesadilla into the pan over medium heat. Cook until the cheese begins to slightly melt and the bottom tortilla is golden brown. Carefully flip to the other side and cook for 1-2 more minutes. Remove to a plate. Slice and serve warm with salsa, sour cream and guacamole, if desired. Prepare and cook the quesadillas as directed. Allow to cool completely and then place in a freezer ziplock bag. When ready to eat, microwave them or place them on a hot skillet until warm. Find Jones Dairy Farm products near you by searching here, and follow them on Instagram, Facebook,Twitter and Pinterest for more recipes using their products! This post is brought to you by Jones Dairy Farm. As always, all opinions are my own. I’m so glad I found this recipe. I’ve already made it twice and plan to make it many more times in the future. Made these with fajita sized, whole grain tortillas. Healthy, yummy and a hit with the whole family. Thank you!! I made these and added onion and substituted sausage. They loved them. Thanks for the recipe. made these, and they are wonderful…….I use my waffle iron, so not to have to flip them!!! What a great idea! Thanks Kathi! I just tried this recipe. So so awesome. This is enough for the week for me.